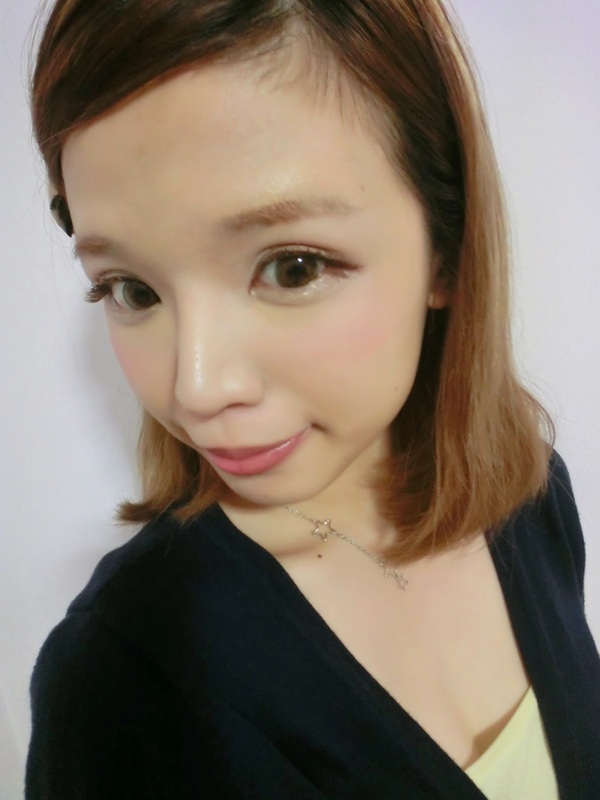 I was browsing through popteen the other day (it had been a long time since i've last seen a gyaru magazine) and i realised that natural girl makeup is the new popteen gyaru trend!! Almost of the items used were BROWN! brown eyeshadow, brown eyeliner, brown fake eyelashes! 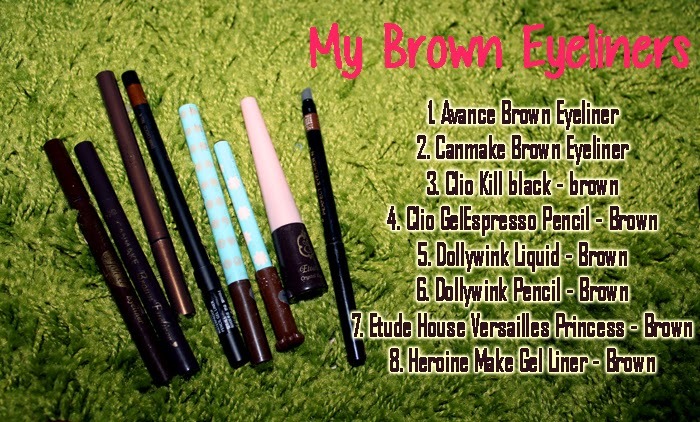 Other than brown fake eyelashes, I've got quite a number of brown eyeliners too! 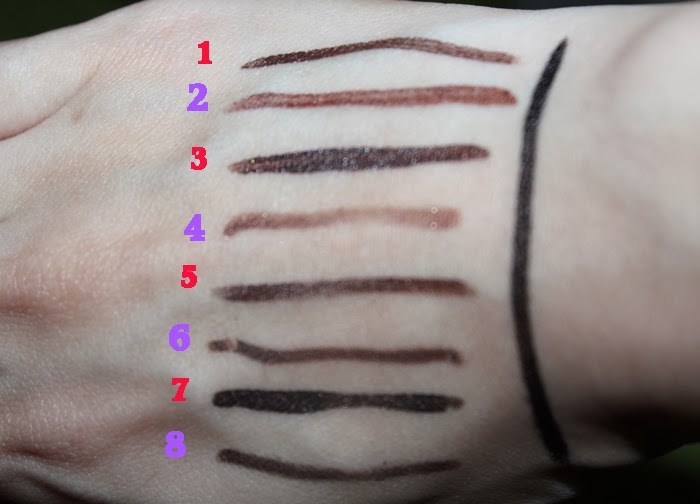 I always collect brown eyeliners because even though they are all "brown" eyeliners..
they are sooo different from each other..
some are lighter, some are closer to black, some are more yellowish/reddish! sometimes it's really hard to find the BROWN you need especially when there's no testers! 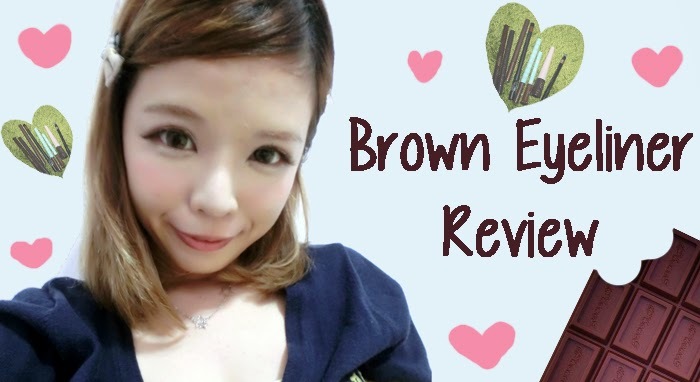 so here's some drugstore brown eyeliner you can buy from Singapore! First, let's see the colours! Which one do you like it best? Personally, I love no.4 as it is the lightest and it has got SHIMMERS! it would suit the natural look yet making your eyes shine with the shimmers! More suitable for super dreamy super light eye makeup! But i would USE no.1, no. 3.no. 5.no. 6.no.8!! Because they are dark (good for defining the eyes) but not too black! You want your eyes to look dreamy but not BLANK. Have you chosen which one is your favourite colour? After I tried rubbing them off 5-6 times, no.4 CLIO GelEpresso smudged and no.8 Heroine Make Gel liner smudged a little as well! They all seems to be quite water proof! 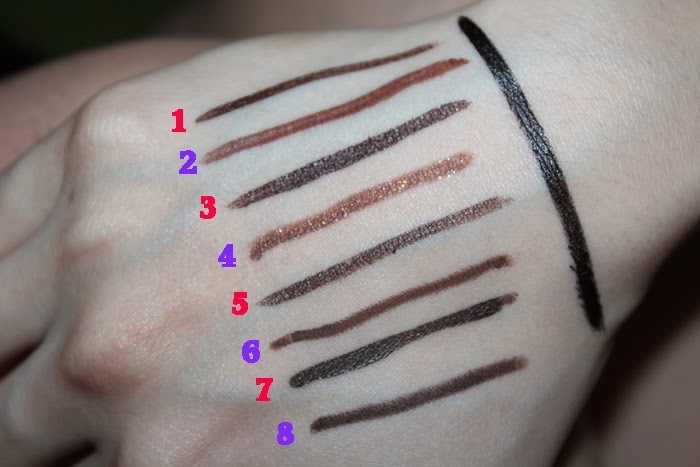 No.6 Dollywink pencil liner scored the best as it stays on well even after rubbing while washing! No.2 Canmake brown eyeliner has got a thick liner so you won't be able to draw really thin lines with the tip. Nevertheless, they look great for brown makeup and tight lining! 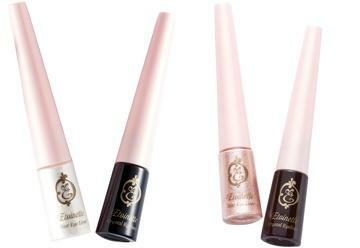 Bottled eyeliner, it might be hard to use if you're a beginner. However, if you like thick and dark eyeliner, it can achieve it easily! 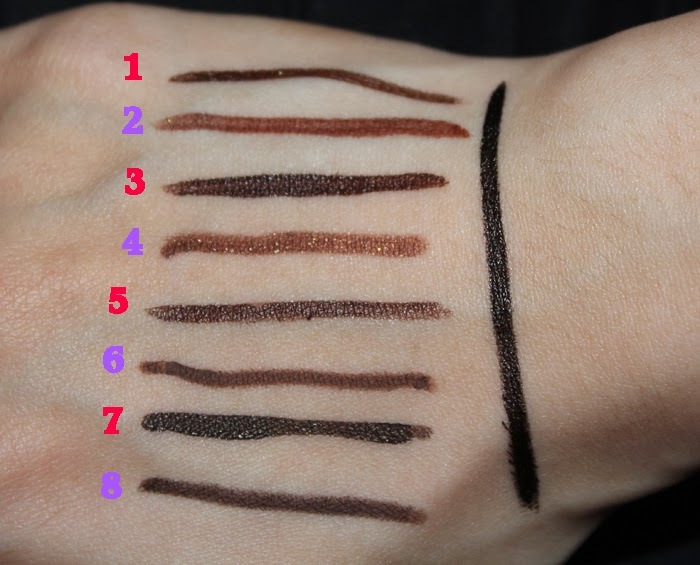 Regardless which brown eyeliner you use, brown eyeliner will make your usual makeup look less harsh! Going to use more brown for spring as its season eyeshadow colour will be pink! and pink X brown is super cute! Do you have a brown eyeliner to recommend? 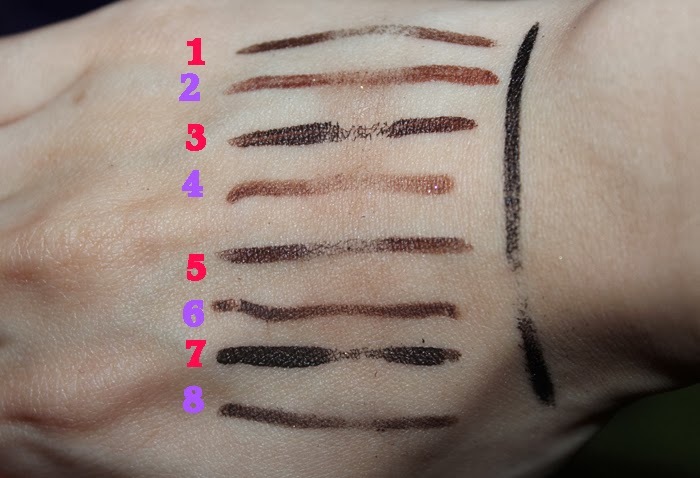 Thanks for reviewing on so many eyeliners! I had that last time!! But I love the colour cause it's a little reddish. THANKS FOR THE REVIEW,I CAN GO EXPLORE BROWN EYELINERS NOW! that's how i feel every single time when i flip through magazines! It's from CLIO as well! hehe my recent hauls from korea, most of the Koreans are recommending that to me. I've noticed as well, the trend is SUPER natural these days! It looks really good on you~ as does your usual style （^ㅅ^）.